The four people who died when a sidewalk collapsed in Dazhou, Sichuan province, on Sunday have been identified as a newlywed couple and a father and his 11-year-old son. After more than 50 hours of searching, the last two people trapped at the site of the cave-in were found on Tuesday afternoon. Tang Zengfu, 45, and his son were dead when they were found, taking the death toll from the accident to four, rescue workers said. 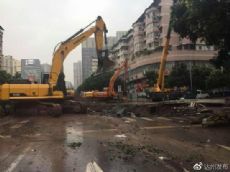 At around 2:30 pm on Sunday, the sidewalk in front of the Dazhou Jimin Hospital suddenly collapsed. Video clips showed four passers-by falling into the hole. At about 10 minutes after midnight on Monday, a woman trapped by the cave-in was found after firefighters used excavators to reach a site 6.5 meters deep. The woman, identified as Mou Biqing, a 23-year-old from Tingzi town in Dazhou's Dachuan district, died on the way to hospital. At 9:36 am on Monday, a man trapped in the cave-in was found, but he died in hospital, according to the Dachuan district information office. The man was identified as He Menglong, Mou's 22-year-old husband. He was also a native of Tingzi. The couple had married four days before the tragedy. He worked as an express deliveryman in Chengdu, Sichuan, where Mou worked as a nurse at a hospital. According to a village official, the couple were very close. Video clips showed them leaning against each other before they fell into the hole. The village official said He's family was poor. His mother was in poor health and his father worked in Guangdong province to support the family. The official said Mou's family was better off and her parents had initially opposed her marriage into an impoverished family. Tang and his son were from Fushan, 30 kilometers from downtown Dazhou. Tang's father died when he was 17 and he had to do odd jobs to support his family. Earlier this year, he started working in a clothing factory in Cambodia. As Sunday was his 45th birthday, Tang had returned to Dazhou to celebrate it with his family. Before the tragedy, he had purchased a cellphone near the Dazhou Jimin Hospital with his younger son. His elder son is a policeman in Dazhou. Because he was on duty on Sunday, he did not meet his father after he returned home. Before the tragedy, he was talking with his father on his cellphone. Suddenly the signal was cut off and he later learned his father and younger brother had fallen into the hole.